Learning about the world outside their comfort zone is a essential lesson for children of all ages. Blending geography lessons into art projects is just one way to do it. Although my son is still a little young to get the full objective of this project, he had fun with the art work and we have been saying “Merci” and “Mahalo” all day instead of “Thank You”. 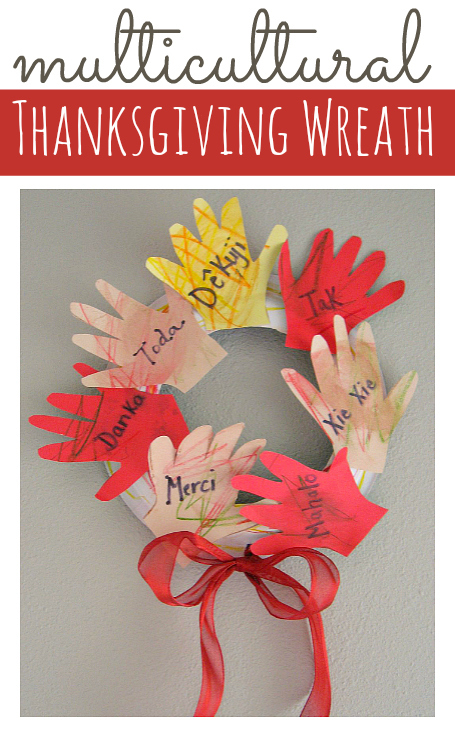 With older children you can pull out a map and choose countries from it, then look up how they say thank you for your own wreath. Gather your materials. 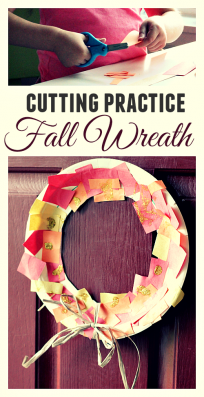 You will need a paper plate , multiple pieces of construction paper, scissors, glue, a permanent marker, and your choice of water colors or crayons. 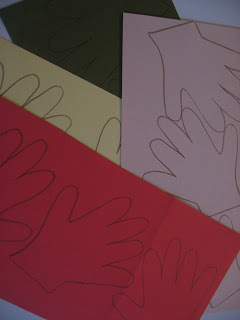 Start my tracing your child’s hand or having them do it themselves. I traced mine first thing this morning and as he was eating breakfast I use it to trace all the other hand prints I needed. Trying to get him to stay still for one hand print was hard enough! Trace out at least 4 but more is better! 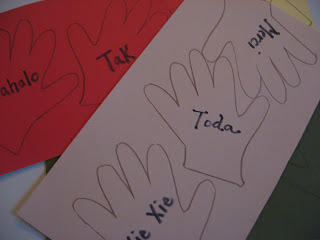 Write the “Thank Yous” in permanent marker in the middle of the hands. 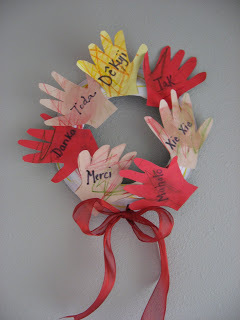 Have your child decorate the hands . We are using watercolor crayons but plain water color paint works wonderfully and crayons work in a pinch, as would light colored paint. You just don’t want to cover up the words. 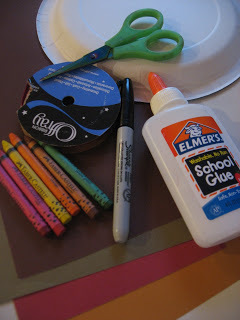 Have your child decorate the paper plate. 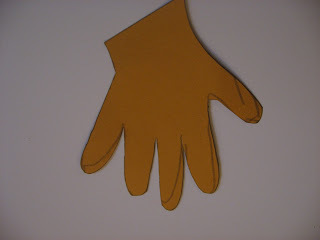 While they work on the plate cut out the hand prints. Cut out the middle of the plate. Time to glue! 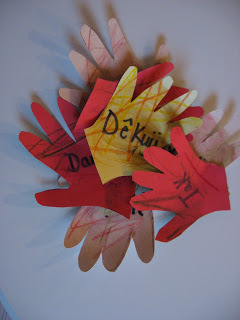 I put a few globs on where the hands needed to go to guide my son, older kids obviously can do this themselves. 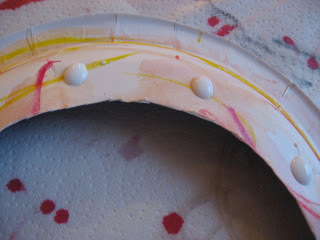 Let dry and add a ribbon! 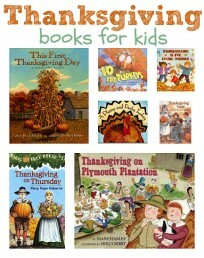 Our book titles are linked to Amazon.com via affiliate links. 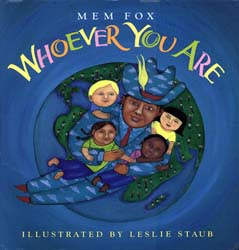 Whoever You Are by Mem Fox gives me goosebumps and brought me to tears when I was a homesick Canadian teaching in St. Louis. The book is simple and talks about the differences of little children all over the world, but focuses on what they all have in common. There are beautiful illustrations that show children in all different cultures from around the globe with a sing song story to carry you along. It is a wonderful companion to the activity today. love the tongue out in concentration look!! Hi, I was wondering how old your little one is. My youngest is 15 months and I am wondering at what age he can do this…he puts EVERYTHING in his mouth now, so I am a bit hesitant about some stuff… thanks for your ideas! 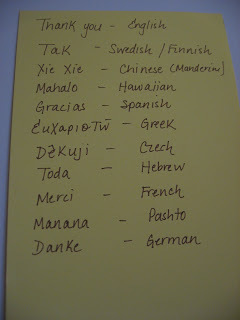 There are a lot of other phrases that may be useful like Hello, Welcome, I Love You etc. Johanna- I know I was so happy I caught it! Julie – My son will be 2 on Sunday, but we started when he was 15 months. I would love to say he doesn’t put things in his mouth but I’d be lying. He puts so much in his mouth still. I roll with it , making sure that I use non toxic materials, and there are no choking hazards. 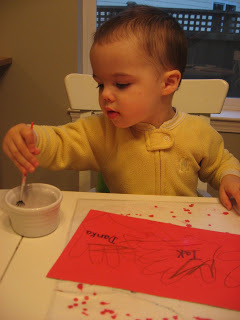 So maybe for you start with finger paint, bug chunky stamps, sponge painting ( with sturdy sponges that don’t bite off) etc… then move into other things as they able. Lizapest – Thank you ! I love it! So nice. My 2 year-old is really into hand tracing right now, too! Great idea. We did your turkey this morning. I really enjoy your blog and all the ideas you share. I do have a question. What do you keep all your crafting/art supplies in? This is a beautiful idea, thanks for sharing! 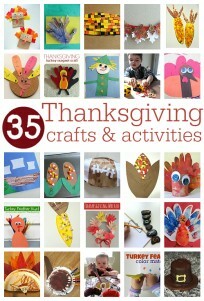 I’m always amazed by all the creative ideas on your blog! I would also love to know, what do you keep all your crafting supplies in! I’m a newcomer to your blog and absolutely love it…full of such great ideas, and I love the book suggestions. We are reading fanatics in our house! This is so creative, I love it!!! So cute. I love how you put books on there that go with the activity. My 3 year old doesn’t hold still unless it’s a book! Thanks! I think I may have to do a post with pictures of my craft closet! We are definitely trying this one out next week – thanks! We started with markers when Esme was 5 months – she only really got into them -scribbling on her own without tons of encouragement -at about 11 months. 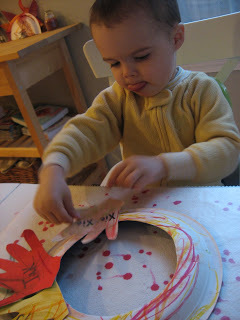 From that point on crafts have been fun -even if Mommy does most of it and all she does is color or paint. And like you, I just roll with it as far as putting things in the mouth. 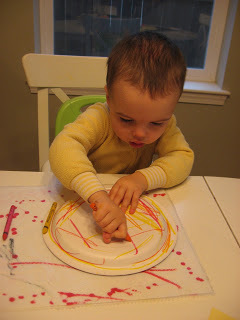 We don’t use much crayon for that reason – the markers and paint work better since they are not as chewable.